We’ve previously looked at The Fever of Urbicande‘s prologue, some of that prologue’s implications, and chapter one of the comic proper. This time, we’ll continue into chapter two of this fascinating story. Chapter two begins the next morning, as Robick discovers that the “buds” on the cube are now clearly longer than they were the previous evening. What’s more, their growth rate seems to be accelerating. And it’s now “encrusted” in the desk and the book against which it was leaning. He narrates that he “wanted to observe the cube longer, but I had to go to see Thomas to submit to him my reflections about Bridge Three.” He writes that he had come up with “several solutions” to the problem “during the night and was curious to see what he’d think of them.” This brainstorming, of course, wasn’t depicted at the end of chapter one, though it’s possible that by “during the night,” Robick means either in his sleep or after he closed his journal the night before. 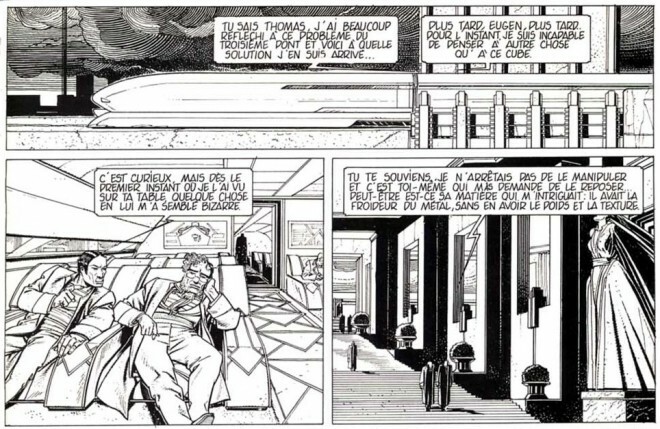 In either case, his journey to visit Thomas lets Schuten depict more of the city, including the first illustration of the South Bank’s public transportation system, which looks like a bullet train that rides on rails. Thomas’s office door is framed by statues, and we’ve seen others throughout the city, along with eagles, which suggest totalitarian iconography (not only of the Third Reich but also of ancient Rome). “And it’s only now that you tell me all this!” Thomas exclaims, looking annoyed, and continues in this vein, as if chastising Robick. “You speak of this as if it were a routine phonomenon. As if each day, you discover an expanding cube on your desk!” To Robick’s shock, Thomas demands to go see the cube immediately. I still recall that, upon first reading this, I suspected that Thomas had some foreknowledge of the cube, or that its expansion correlated to some secret knowledge, to which he was privy but Robick was not. And it’s true that Thomas’s attitude does seem one of privilege, relative to Robick. Whether or not Thomas is closer to those with power in the city, he does seem closer, psychologically, to those people. 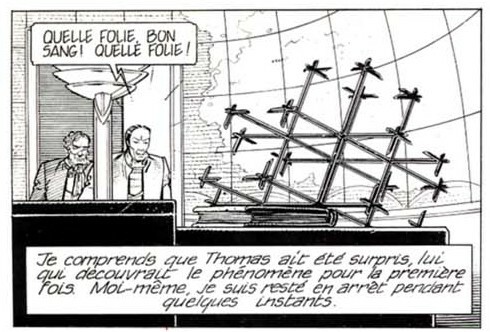 But Thomas’s reaction almost certainly doesn’t indicate any secret knowledge, although it does speak volumes about how he secretly sees Robick as his inferior: Thomas is more the bureaucrat, while Eugen is the artist employed by bureaucrats. But beyond his attitude towards his supposed friend, Thomas’s reaction also indicates at least as much about how little passion he truly feels about Bridge Three as it does how intrigued he is with the phenomenon Eugen reports. The day before, both men were fascinated by the cube, and Thomas probably has not forgotten it. But Eugen alone was able to literally forget about the cube, in his passion for Bridge Three. Thomas, meanwhile, continued to be distracted by thoughts of the cube. His cool demeanor now seems less a personality trait than an indication that, while he may well side with Eugen about Bridge Three, he simply doesn’t care about it all that much. Because we’ve never seen him so passionate as he is, chastising Eugen here. And as intriguing as the cube phenomenon is, it’s telling how utterly and immediately Thomas drops any concern for Bridge Three, which for Robick represents so much. For his part, Robick looks bored, even put-upon, as it he can’t stop thinking about how to solve the problem of a missing Bridge Three. Yet Robick goes along with Thomas, again indicating who has the most power between them. Of course, Robick isn’t immune from fascination with the cube. He seemed susceptible to it both the previous morning and the previous evening. And he’s about to become fascinated again, because when he and Thomas enter his office, the cube has grown dramatically. The “buds” on all sides have expanded to the points at which the sides of cubes, adjacent to the first, would terminate. And at those points, they have sprouted new “buds,” none longer than on the two sides facing the structure’s interior, where these longer “buds” seem to be growing together, as if trying to complete the cubes adjacent to the original. The word “lattice” is apt, suggesting the structure’s geometry, and it’s worth noting that lattices do occur in nature, retaining something of the organic implication of the word “buds.” But it’s hard not to note that this lattice also suggests the look of scaffolding (and has been translated as such). Moreover, the way those buds are coming together to complete the adjacent cubes suggests something far more eerily specific: the way bridges are built, starting at both ends and meeting in the middle. Clearly, his approach is completely different, much less that of a politician and much more that of an artist or a scientist, defined by abstract thought and not social ramifications. It’s enough to confirm what the commission has told him, about the distinction between an urbatect and a politician. With Thomas gone, Robick demonstrates his intellectual curiosity by analyzing the lattice further. He notes that it’s now not only embedded in his desk but that “entirely traverses” it, with “certain posts emerging again on the other side.” He also notes that “the initial cube is growing” in size, while the cubes developing adjacent to it seem to remain exactly the same dimensions as the initial one. In describing this, he uses the writes that “the whole is developing in a symmetrical manner.” Obviously, this choice of words reflects his profession. But the symmetry eerily reflects his own concern over Bridge Three, just as the longer posts are clearly going to “join” in the middle, echoing bridge construction. Robick doesn’t remark upon any such connections to his reconstruction project, nor to Bridge Three, but they’re clear enough that, even if the reader doesn’t make them consciously, the reader feels a certain thematic echo between the two plots. Robick, not inclined to think politically, doesn’t seem to realize how his words could be misinterpreted. Indeed, the far sides of the cubes adjacent to the original are just now meeting, and Robick can’t help but remark, “It’s a marvel, isn’t it?” He says the ends are “merging perfectly!” — as if in admiration of the lattice, which Thomas seems to fear. 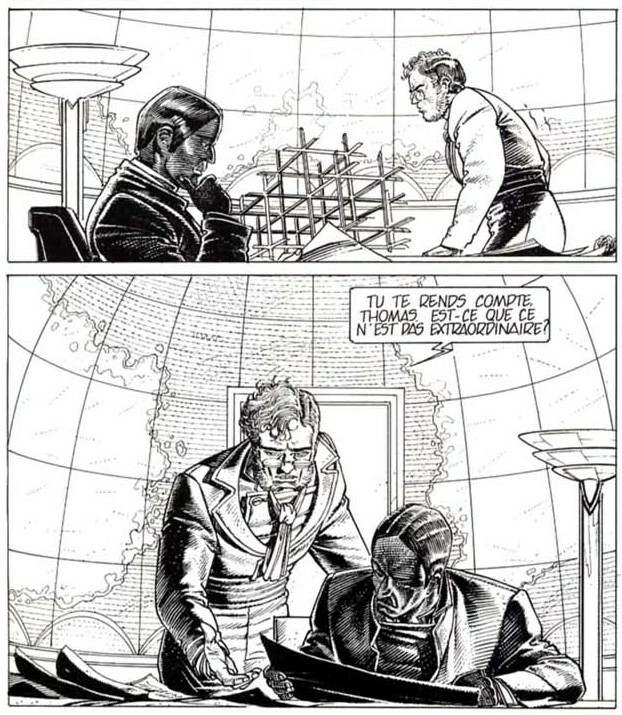 Equally astonishing is how well Peeters and Schuiten execute the sequence, in which we can perfectly understand how a misunderstanding could occur. In the prologue, Robick’s flamboyant rhetoric ultimately fails because he fails to understand his audience. We’ve since seen how Robick seems incapable of political calculus, although he’s eager to employ mathematical calculus. Now, his lack of political and social consciousness makes him unaware of what he’s suggesting about himself. Thomas looks deep in thought as he examines Robick’s work. But we’ve never seen Thomas so contemplative, and it’s easy to guess that he’s also beginning to consider something deeper about his friend. Again, the naive Robick continues to implicate himself: “And to think that it’s here the phenomenon began! I’ll give it my name. I’ll call it the cube — no… the network of Robick. Yes, that’s it: Robick’s network.” It’s one of the few real jokes in the entire series, a play on the famous puzzle toy known as Rubik’s Cube, which has delighted several curious mathematicians. But it’s a joke that serves a narrative point, continuing Robick’s unintentional self-implication. After all, what could be worse, relative to Thomas’s concerns about the threat posed by the lattice, to enthusiastically put one’s name on it, as if taking credit for it? Of course, Robick’s really only demonstrating his pride and naivete, but it’s a potentially fatal error in such a serious, semi-totalitarian state as this one. Whatever their attitudinal differences, Thomas doesn’t want to believe the worst about his friend. “You’re deluded. Eugen… come. You shouldn’t stay here! We don’t know what may happen. My house is open to you, if you want it, for as long as you want it!” Clearly, Thomas now has an extreme concern for his friend, as well as about the lattice. He seems to interpret Eugen’s naivete as mental illness, and it may well be a society like this one. Authoritarianism cultivates fear, after all. But Thomas isn’t so ill: he recognizes the political ramifications immediately, of both the lattice and his friend’s rhetoric. The chapter ends on this ominous note. One could hardly imagine a greater disconnect between two friends. And what’s worse is that one of them recognizes it not at all. But one could also hardly imagine a better illustration, in such little space, of the way authoritarian regimes twist rhetoric, induce paranoia, and breed a distrust, even between friends, that confuses naivete and the pure thrill of intellectual discovery for something suspicious and dangerous. It’s also another example of how The Fever of Urbicande explores in more depth some of the themes of The Walls of Samaris. We’ve already seen how Urbicande elaborates upon the reconstruction of Xhystos, which is only implied in Samaris. But there, Xhystos was only vaguely totalitarian. Here, that totalitarian air is more clearly articulated and is even united with the city’s architecture. In The Walls of Samaris, Franz is a pawn of his city’s ruling authorities, spurring his friends’ concern. In Urbicande, Eugen’s place in the city’s power structure is a bit clearer, as is the idea that he’s profited from that structure. His friend too is concerned, but that concern is much more apparently tied to the climate of fear authoritarianism brews — and in this way, the implications of authoritarianism, in terms of how it can deform rhetoric and bend even friends’ suspicions, are depicted much more fully than any simple description of how the state operates, which remains obscure to us. After all, it’s only through the effect of a climate upon character that we may come to feel and understand that climate. 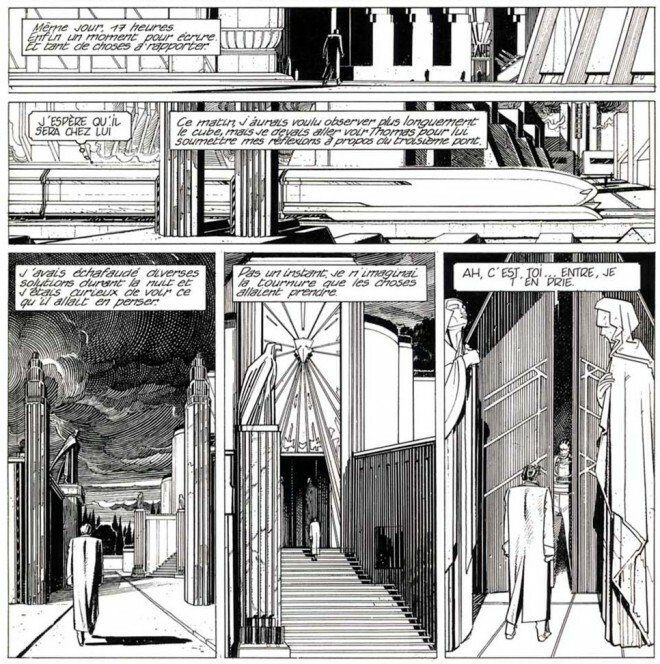 Schuiten tends to get the bulk of the credit for The Obscure Cities, and that’s certainly justified: it is the architectural precision of his wonderful artwork, more than anything, that lives in the reader’s mind when far from the books themselves. 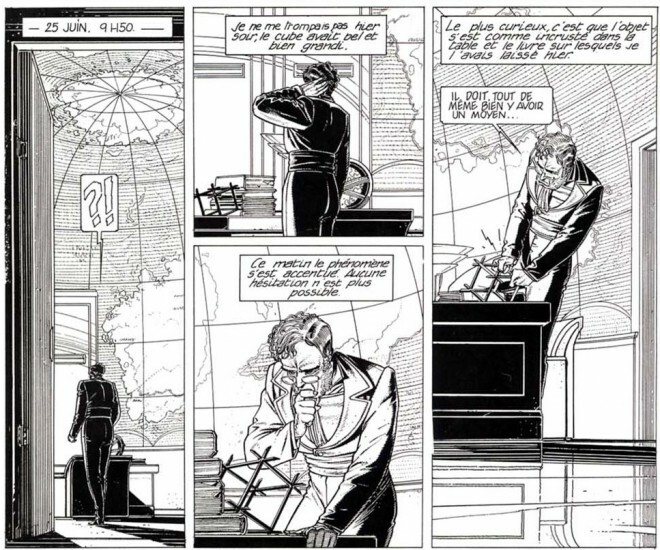 But such a wonderful turn of plot, relying on both art and dialogue to convey in the reader a sense of what’s not actually said, is a testament to Peeters’s essential and under-appreciated role in the collaboration. 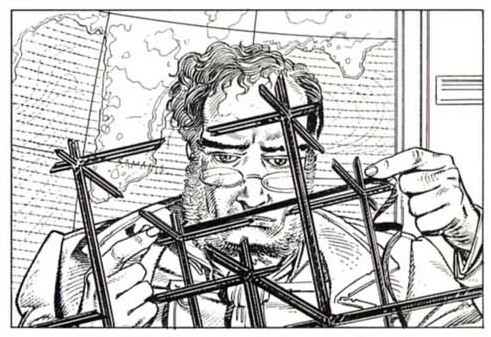 That this turn is so intimately tied with the look of the city’s architecture, and what’s implied about its political structure and organization, is what makes a book like The Fever of Urbicande so successful, as a unified story and work of comics art.